Tracy Falbe returns to the blog as this week's featured interviewee. 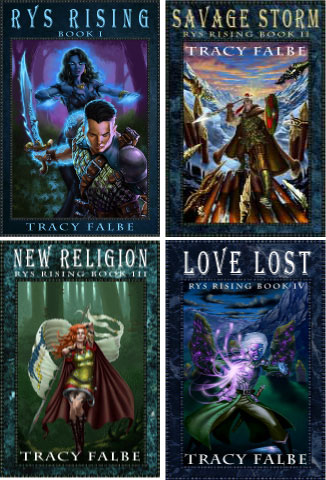 Tracy is the author of the Rys Rising series of fantasy novels. Back in December 2012, I participated in her blog tour for the release of Love Lost, the fourth and final novel in the Rys Rising series, so it's great having her back for another post. Let's see what Tracy has to say. Obviously I’m a novelist. If I couldn’t say that about myself I would despair. I’d like to say I have some other fascinating career like safari guide, but writing is what I’ve always wanted to do. Any job I ever had was just a paycheck. Building my publishing company and writing are what define me professionally and I’m so happy to be doing that. Aside from that I’m very into the local food movement. I support local growers through direct relationships whenever I can, and I am working toward making my yard as productive as possible. I have 10 young fruit trees planted along with grapes, kiwis, and raspberries. I also grow vegetables and brought in 300 pounds of produce for my family last summer despite the drought and its associated difficulties. I use natural growing techniques and follow permaculture principles. Other things I enjoy are dogs, cats, boating, swimming, bicycling, and fantasy and sci fi. Although I spend much of my creative energy on fiction, my reading has a big nonfiction focus. I’m also an absolute junkie for documentary films. I learn so much from them. 2. What’s the name of your newest or latest book and what’s it about? My most recent novel is Love Lost: Rys Rising Book IV. Love Lost brings together all the story lines of the Rys Rising series and chronicles a great war between the magical races of the rys and tabre and the humans of two civilizations that serve them. It’s an epic about lust for power and desperate courage in the defense of the ones you love. 3. Is this book part of a series or standalone? Love Lost is the fourth and final book of the Rys Rising series. Not counting my writing as a child and teenager, of which I did a lot, I’ve been writing seriously as an adult since 1997 when I began my first novel Union of Renegades. 5. From where and whom do you draw inspiration? Everything inspires me. Anything I read or see or experience goes into the toolbox. I’m very observant of people and sensitive to the emotions they project. To try and be specific I am inspired by the natural world, history, social sciences, and mythology. The past few years I’ve been studying Joseph Campbell and Carl Jung. The first big influence on my writing was Frank Herbert. I liked the scope of the galactic empire and the huge multi-character point of view he created for his Dune novels. I read Dune when I was about 12, and I was delighted with all the shifting points of view and how they were woven into a complex society driven by religious politics. 6. What advice would give new or aspiring writers? I never know how to answer that question because I don’t want to presume to tell someone how to write. There is no correct way aside from the basic technical requirements of spelling and grammar. I can say what works for me is to try and write daily. This will develop your ability to focus and tap into your subconscious. Also when looking over your work and editing, always ask yourself if other people would be able to comprehend what you’re saying. Although you can’t reach everyone and not everyone will be able to understand, your goal remains communication. 7. Who do you see as your ideal reader? You know I’m always reading about how I need to know my niche and know my reader, but I honestly don’t know if there is a profile for my target audience. Women and men like my novels. People younger than me and people older than me have enjoyed my novels. My readers are in various countries and belong to various ethnicities. I guess my ideal reader is someone who likes my novels and is willing to spend money on them. 8. Tell us about your writing process. Are you a planner or outliner? Well I generally have an idea where I’m going with a novel in my head and then I write towards that goal and see what happens along the way. I’ve never outlined a novel on the macro level, but sometimes I need to make plans on a micro level across one or two chapters if I have a lot of complex action taking place across multiple venues and I have to reveal everything in a sequence that is comprehensible and hopefully exciting. Even when I do plan, I usually end up deviating from my notes a little while actually writing. The thought of planning out a whole novel with an outline and then writing it sounds utterly stifling to me. It’s a novel not a research paper. As characters develop they can make unforeseen demands on the narrative and typically I must accommodate them because it’s their novel. As for the actual writing I try to write every day unless I’m just too mentally depleted by other things. Even then I might write anyway because I hate the thought of not making progress. After making an initial draft, I go through the novel chapter by chapter and edit and rewrite and edit until I am satisfied. I figured out once that I put about 10 to 16 hours of labor into every chapter through all these stages. 9. What are you thoughts on writers paying for reviews as John Locke is reported to have done? I suppose it’s understandable behavior that is going to happen. Most any industry pays to generate positive publicity, including reviews. I have chosen not to pay for reviews. I spend my marketing budget on advertising and encourage my readers to give me star ratings and reviews. If paid reviews are a problem, I don’t really care. There’s about a million more problems in the world far more pressing than paid book reviews. 10. Some book reviewers won’t accept independently authored books for review. What are your thoughts on that? Are they missing out? Of course they are missing out. I’ve read some wonderful indie novels and some big name best-sellers that were insulting to the intelligence or at a minimum boring. Of course both approaches can produce brilliance or crap. There are no absolutes, but for a book reviewer to just issue a blanket ban on a certain form of production is like a restaurant critic never accepting a home cooked meal. The truth is most restaurant food is salty mediocre fare meant to sell drinks, and home cooking from a good cook is wonderful and memorable. 11. Where can readers find your work? 12. Where can readers find out more about you? I invite people to read my blog Her Ladyship’s Quest or browse my Pinterest boards . In 2000, I earned a journalism degree from California State University, Chico with the conscious ambition of becoming a fiction writer. With the rapid demise of the newspaper industry and journalism in general, novelist is not such a daft pursuit after all. It's not like I'm actually going to get a job that values my education. Luckily I'm cursed with the impulse to write in a popular yet competitive genre. This week's interview is with Angella Graff, author of The Judas Curse. One of a series of posts I did where I featured new authors. Thank you for the great interview, Scott. Your very welcome, Tracy. Great having you on the blog again!